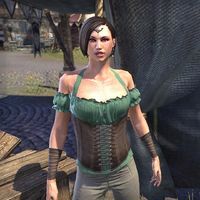 Heralda Garscroft is a Breton holiday achievement furnisher who can be found in each of the alliances' capital cities and Vivec City in Vvardenfell. These furnishing items can only be purchased once the requisite achievements have also been completed. "You should be honored. I only sell quite interesting things to quite interesting people." "Names are like noses. Everyone has one. What you want is a reputation. I love to help turn a house into a home when a good reputation is involved." "Now, I usually only deal with heroes of a higher stature, but I like you. So this time I'll make an exception." "Starting to make a name for yourself? I like that. Let me show you something that will enhance your reputation and decorate your home at the same time." 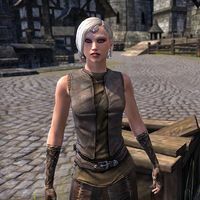 Heralda used to have white hair and a brown sleeveless outfit. This was later changed, and she now has black hair and a green shoulderless outfit. This page was last modified on 23 December 2018, at 12:33.